The Lalin Fine Art Photography Gallery opened its flagship boutique at Raffles Hotel Arcade on 8th July 2014, with Lalin Jinasena, Gallery Owner and Photographer, pioneering the way for fine art photography community in Singapore. According to Lalin, photography, as an art, has gained momentum in the United States and Europe and is seeing a similar emergence in Asia. “We are starting to see greater appreciation for fine art photography in Singapore as well and is encouraging for the photography community” said Lalin. The 720 square foot gallery is a showcase of breathtaking moments captured by gallery owner and artist Lalin Jinasena, an award-winning interior designer and hotelier from Sri Lanka. Lalin’s images range across wildlife, landscape, portraits, culture, botany and architecture across continents. While his native Sri Lanka, rich in natural beauty and culture proved to be the perfect background for his shots, Lalin’s extensive travel through the United States of America, Europe and Africa has enabled him to freeze the awe-inspiring moments on film. He shared with us that he waited for days to take some of his photographs, as he had to wait for the appropriate moment. Capturing birds in photographs was particularly challenging for him. In keeping with Lalin’s personal endeavors in wildlife conservation, Lalin Fine Art Photography Gallery contributes a share of its proceeds to the care and wellbeing of its adopted baby elephant Anuradha at the Elephant Transit Home in Udawalawe, Sri Lanka. 1. From different categories of photographs taken, which category do you enjoy taking photographs of the most and why? I love wildlife, and have spent a lot of time in the wild, even many months in solitude living in the jungles of Sri Lanka and photographing amazing species of birds, mammals and scenery. My favourite subjects are usually leopards and elephants. Leopards because they are the most graceful cats in the wild, and elephants because I adore and respect them and have had many close encounters with them in the wild. 2. Among all your artworks, which one is your favourite and why? The Photograph entitle “Love”. 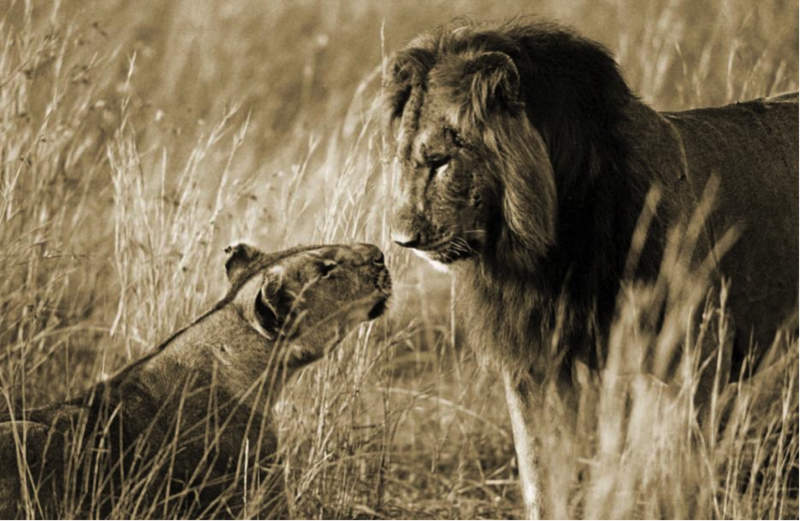 It is of a lion and a lioness staring into each other’s eyes. It is one of those rare and precious moments you get to experience in nature which you never expect. We were in the Masai Mara in Kenya on an early morning drive, and came across a male who was walking steadfastly in a direction through the tall grass. We followed him for a few miles and realized he was heading to his pride. As he approached his pride a female came out to greet him and sat on the ground. The male walked up to her and stopped, and they just stared into each other’s eyes in this poignant moment of affection and tenderness. It was almost a human moment and not something you expect from wild animals, least of all lions. When you look at the photograph you can only wonder what was being communicated, to me it seemed a little bit like love. 3. What makes the good photograph stand out from the average? How a photograph makes one feel is what makes it good. It could be grainy, gritty and not even properly focused, but if that photograph can move people, it’s a good one. 4. Whose work has influenced you the most and why? I try to remain as uninfluenced as possible, because I prefer to allow my creativity to be my own, instead of it being influenced by other’s work or styles. Hence, I don’t follow too many photographers. That being said, one person whose work has impressed me is Steve McCurry who photographed the famous Afghan girl. His has been living my dream life of photographing for National Geographic. 5. What is the one thing you wish you knew when you first started taking photographs? Previous Post [Review] Ditch All Rules with MITJU’s Customisable ‘Tick-Tack’ Shoes!